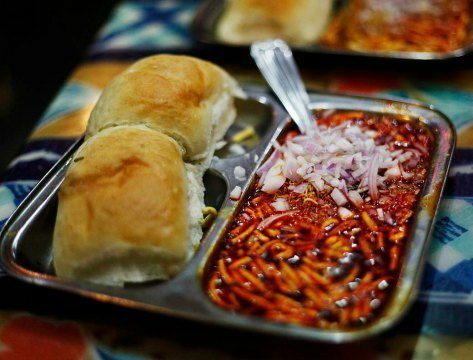 In the Indian state of Maharashtra, the capital city Mumbai is a treasure trove of street food. Nearly everywhere you turn in this vibrant and exciting city, formerly known as Bombay, you will find delicious food being served up by vendors on its streets. Throughout Mumbai, street food connects people from all walks of life. And life seems to spill onto the streets here, as roadside diners not only enjoy the finished product from vendors (also known as hawkers), but can see the dish being prepared from scratch before their very eyes. Of all the Mumbai street food that the city’s inhabitants are passionate about, ‘vadapav’ is one of the most famous. Otherwise referred to as a ‘poor man’s burger’, this dish features a spicy potato patty that is deep-fried and served in a small bread roll, topped with fried green chillies and spicy chutneys. Vada pav is the ultimate hand-held convenience food and, as its moniker suggests, will only set you back 5-10 rupees. However, its growing popularity and iconic status mean that it is now starting to feature on the menus of expensive Mumbai restaurants and hotels, at greatly inflated prices. It has also become a firm favourite with the rich and famous, and considering that Mumbai is the home of India’s Bollywood industry,you’ll often see a well-known faceenjoying a vadapav or two! Variations on the original include a samosa pav, which uses a samosa instead of the vada, and a cheese vadapav that includes slices of cheese – much like a cheeseburger. One area of Mumbai that has become synonymous with city’s love of street food is Chowpatty Beach. Rammed with kiosks serving a whole host of culinary delights, this area is a haven for street food fans. The best time to visit is at sunset, where you’ll be able to try a diverse range of foods – from classic pavbhaji (spicy mixed vegetables in a bun), to panipuri (a small puffed bread with a filling of your choice) and bhelpuri (a crunchy, sweet-and-sour mix of puffed rice, onion, sev, potato and tamarind chutney). It’s like dining at a fine Indian restaurant but with stunning sea views and at a fraction of the price. Another area of the city that’s filled with street food vendors is the affluent Colaba district. Here you can discover raw sugar cane – enjoyed as a snack or drink – kulfi (milk ice lollies), dosas (a savoury crepe originating from southern India) kebabs and more. It really is a destination for food-lovers visiting Mumbai. Of course, you may not have the time or resources to travel to Mumbai in search of fresh, authentic Indian street food. So for a taste of India that’s much closer to home, why not pay a visit to one of the best Indian brasseries in London? Unlike your typical high street curry house, these restaurants serve a range of food as diverse as India itself, from street food dishes and snacks to curries, thalis and in-house specialities.